Capt. Matthew Bacik talks with a KSTP-TV reporter about his experience testing an new type of prosthetic device. It's something most of us take for granted – the ability to move. However, the folks at Mayo Clinic's Motion Lab know that reality is more complicated for many people. The Motion Analysis Lab studies human movement and uses the resulting data to determine the best way to treat people who may be having problems with their gait and other movement difficulties. With their sophisticated techniques, staff in the Motional Analysis Lab evaluate all aspects of a person's movement to aid in treatment today and conduct research into future clinical applications. These efforts (and the Motion Analysis Lab) are led by Kenton Kaufman, Ph.D., who set out to apply for and secure two hard-earned grants from the Department of Defense to allow the lab to help wounded combat veterans. As reported by KSTP-TV, the lab it currently testing a new type of prosthesis that uses "special elevated vacuum technology and computer-aided design and high-end urethane manufacturing products." While all this science goes over our heads, we do know that the device can help soldiers like Capt. Matthew Bacik of Alabama. 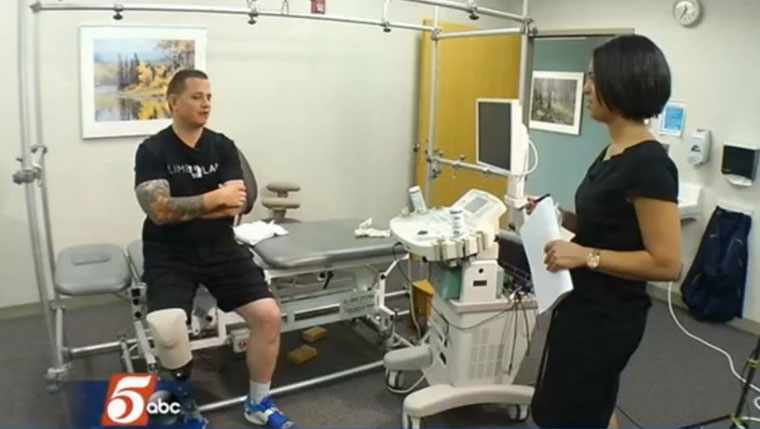 He was recently in Rochester to help Mayo Clinic test out the new prosthesis, and KSTP was there to document it. In 2005, while serving his second tour in Iraq, Bacik was trapped inside an armored vehicle after a blast. His leg was severely injured and had to be amputated. He tells KSTP he feels lucky to be alive and to test out this new technology. It's a "snugger or whole fit" compared to other prostheses, he says. And, "It feels more connected to you, because your brain kind of has a sensation of where your foot is in space and time." "This is the first time we're doing this kind of testing with the combination of new components," Dr. Kaufman tells the station, "and our goal is to provide objective data to advance the state of the art work." For Bacik, the goal is simply greater mobility and movement to help with his most pressing current duties. "I've got a lovely wife and two baby girls -- they're six and seven," he says, "Now I can put them on my shoulders and run them up the stairs much easier." Watch the video below, then go out on a limb and share your comments and share this story using our handy social media tools.